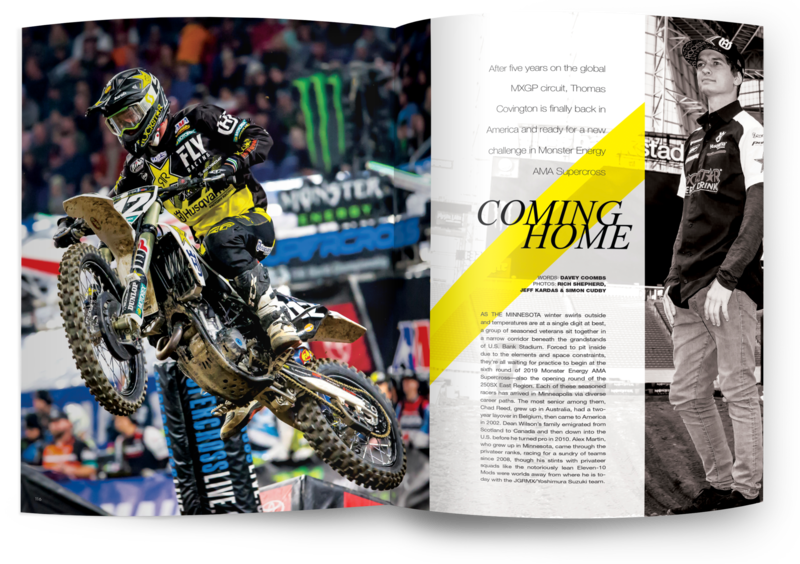 "Coming Home" appears in the May issue of Racer X Illustrated. Want to give our revolutionary new digital edition a try? You can read this feature in its entirety and the entire issue for FREE. Go subscribe after reading! As the Minnesota winter swirls outside and temperatures are at a single digit at best, a group of seasoned veterans sit together in a narrow corridor beneath the grandstands of U.S. Bank Stadium. Forced to pit inside due to the elements and space constraints, they’re all waiting for practice to begin at the sixth round of 2019 Monster Energy AMA Supercross—also the opening round of the 250SX East Region. Each of these seasoned racers has arrived in Minneapolis via diverse career paths. The most senior among them, Chad Reed, grew up in Australia, had a two-year layover in Belgium, then came to America in 2002. Dean Wilson’s family emigrated from Scotland to Canada and then down into the U.S. before he turned pro in 2010. Alex Martin, who grew up in Minnesota, came through the privateer ranks, racing for a sundry of teams since 2008, though his stints with privateer squads like the notoriously lean Eleven-10 Mods were worlds away from where he is today with the JGRMX/Yoshimura Suzuki team. Just across the hallway, sitting on a folding chair in front of a glass refrigerator, is another veteran, though this one is brand new to supercross. Thomas Covington grew up in Alabama, doing all the big amateur races across America. He had some success, winning three times at Loretta Lynn’s, but when he turned pro in 2014, there were no good rides waiting for him. So he packed his bags and headed to Europe that spring to try a couple of MX2 Grand Prix races with a French-based Kawasaki team. They were impressed enough to sign him for the rest of the season. Two years later, Covington won the Mexican Grand Prix, then moved to Rockstar Energy Husqvarna in Belgium, where he added more wins. Covington stayed on the FIM World Championship circuit for five years with decent success before finally inking a deal to return this season with the AMA version of Husqvarna’s factory team. Now here he is, 22 years old and probably the most seasoned and well-traveled rookie in the history of Monster Energy AMA Supercross, ready to finally make his debut. READ THIS ENTIRE STORY FOR FREE HERE! The Racer X Digital Edition has been completely rebuilt, allowing readers to scroll vertically from the beginning of the issue to the end on any digital device. Gone are apps, downloads, and third-party domains in favor of a single interactive document with dynamic motion and embedded video content. A “clickable” Table of Contents is accessible with one press for immediate, frictionless access to any part of the magazine. Test ride the issue and read "Coming Home" for FREE here.